Show your style! Show your personality! Create a belt, bag, scarf and more. 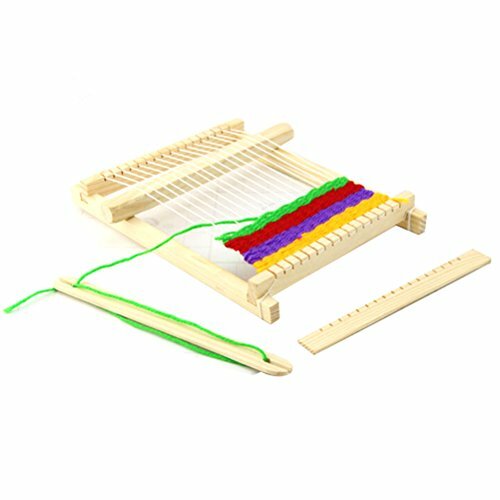 With Made by Me Wooden Weaving Loom Kit you will have the ability to create a number of accessories for all your different outfits. This kit is ideal for those wanting to show off their sense of fashion and design. – Promotes creativity and critical thinking. – Create cool accessories like belts and scarves. – Use your favorite colors and style to create your own accessories. – No mess and easy pick up after project is done. – Great to use as a craft project at parties. 1 * Wooden DIY Handloom Loom Toy Weaving ToolColor: Wooden. Material: Wood cotton cord. Size: 23.5*17.7*3.3CM. Promotes creativity and critical thinking. Create cool accessories like belts and scarves. Use your favorite colors and style to create your own accessories. No mess and easy pick up after project is done.